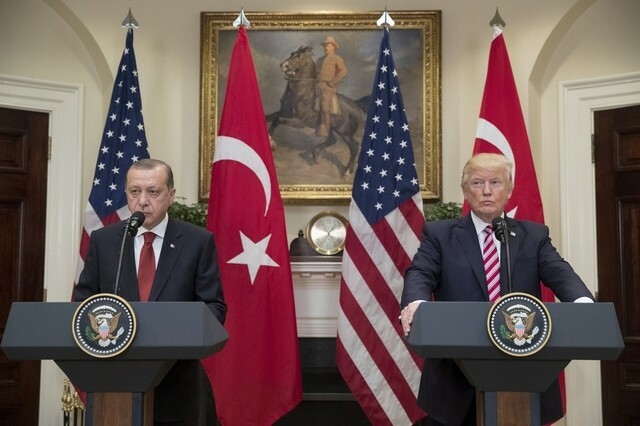 The White House Monday said President Donald Trump is open for a future meeting with his Turkish counterpart Recep Tayyip Erdogan who extended him an invitation to visit Ankara as ties between the two NATO allies warm again following few years of frost relations. “President Erdogan invited President Trump to visit Turkey in 2019. While nothing definite is being planned, the President is open to a potential meeting in the future,” a White House spokesperson said. The invitation comes in the wake of President Trump’s orders for the withdrawal of US ground troops fighting the Islamic State group (ISIS) in Syria as Turkish forces have begun reinforcement of their presence near the Syrian border in view of crushing Syrian Kurdish People’s Protection Units (YPG) militia and the Islamic State group (ISIS). Turkey views the YPG as a “terrorist offshoot” of the outlawed Kurdistan Workers’ Party (PKK), which has been waging an armed fight against Ankara since 1984. The YPG has been a key ally of the US-led international coalition fighting ISIS in Syria since 2014. Trump’s decision to pull out American forces, according to both Turkish and American officials, came following a phone conversation with Erdogan. The US leader also indicated that he believes in Erdogan in the fight against the terror group. In addition to the invitation, a Turkish foreign ministry delegation would go to Washington for talks early January while a US military delegation would arrive this week in the Turkish capital to discuss how to coordinate the US withdrawal, reports say citing Erdogan’s spokesman, Ibrahim Kalin. The developments signal a diplomatic revival between the USA and Turkey, NATO allies. Washington last week approved the sale of $3.5 billion in missiles to Turkey despite a reluctance after Ankara neared Moscow to buy a rival military equipment. Ankara recently freed a US pastor detained in Turkey for supporting the July 2016 botched military coup against Erdogan. The White House maintained that Evangelical leader was unfairly nabbed. President Trump also reportedly asked state security and legal agencies to look into the possibility of extraditing Erdogan’s foe and former ally Fethullah Gulen, blamed for masterminding the failed coup. Posted by KanelkaTagba on Dec 26 2018. Filed under Uncategorized. You can follow any responses to this entry through the RSS 2.0. Both comments and pings are currently closed.